We are pleased to announce significant updates to eXo Platform Documentation, especially the technical guides. Let’s start with our substantial changes to Managing eXo Platform look and feel. “Skin elements” has been totally updated with new information about skin service and default skin in eXo Platform 4. Customizing a site skin now includes step-by-step instructions and common use cases that developers may come across. Just by following these steps, you will see stunning changes to your skins. In addition to customization, creating new skins for a site or portlet is now easier than you might imagine thanks to visual examples. The whole of the Management chapter has been reviewed and updated to the eXo Platform 4 context. Stay tuned, more updates to this chapter are coming! The Security chapter consists of new information about configuration of JAAS, gadget proxy, and HTTPS as well how to clear the “Remember My Login” token. The Customizing environment variables section will make it much easier for you to learn about this topic. Start with basic customizations, then go deeper into advanced ones―that’s how you feel free when discovering eXo Platform. Do you have trouble integrating LDAP into eXo Platform 4? Solve your issues by following new steps here. 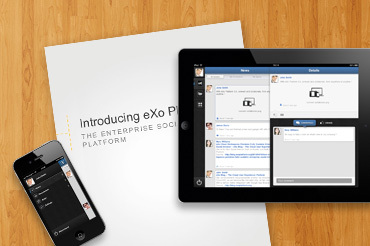 Have you used many startup profiles in eXo Platform 3.5? Most of them are no longer available in eXo Platform 4. The Startup profiles section tells you all about the changes. Your feedback feeds our motivation, so don’t hesitate to tell us your ideas. All will be gratefully appreciated and considered!